Salvador Villolobos was born on July 16, 1983 in Jerez Zacatecas, Mexico. Villalobos' father was already living and working in Milwaukee. So, in 1990, his family decided to officially migrate to the United States. The family arrived in Milwaukee in the middle of winter when Villolobos was just five years old. They settled in the Washington Park neighborhood, where they still live today. He was used to playing outside with his friends all day long in Mexico, but in Milwaukee he would go straight home after school. He wasn't very fond of this, saying "I would cry, I wanted to go back." Like every other new kid, he got picked on because he didn't know what was considered "cool." Still, coming to Milwaukee opened Villolobos' eyes to many new races and cultures because of the diversity of the community. After dropping out of school for a year, he went back to school to get his GED. ​He was in high school when he met the woman who would later become his wife. Today, they have four children. ​Being the family man that he is, Villolobos wanted to stay close to his parents' house. Therefore, when he saw a Milwaukee Habitat for Humanity sign in the lot next to his parents' house, he jumped on the idea of approaching the organization to buy a home. 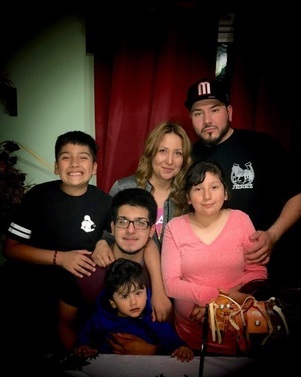 Milwaukee Habitat for Humanity doesn't usually let people pick where they want to live, but when the program found out that the home was so close to Villolobos's parents' house, they let him purchase the property. Viloalobos says it was a "blessing that he just so happened to find out they were going to build a house here." Part of the agreement that he had with Habitat for Humanity was that he had to put in 120 hours of sweat equity. Safety is always a concern for families in Milwaukee. Villolobos and his family feel safe in the neighborhood because they've lived here his whole life. Living so close to his parents makes him feel even secure because the community looks out for one another at all times. However, as he gets older, Villolobos wants to move away from city life. He would prefer a suburban home where his younger kids can play outside without having to worry about safety.